Your child’s imagination is constantly evolving, and it’s important that you help to nurture it from birth and throughout their childhood. By sparking your child’s imagination, you help to stimulate their brain which in time will allow them to dream and imagine new possibilities. More importantly, allowing your child to create their own imaginary situations can help with their speech, empathy, problem-solving, social skills, confidence and much more. Messy Play – There’s no limit to how messy the play can be and don’t worry, taking extremely messy play outside is even better as it allows your children to explore the natural world around them, whilst keeping your home clean. Give your child a box of crafts, paint, various materials and glue to choose from so that they can create whatever enters their mind. Non-toxic modelling clay is also a staple for messy play! Storytime – Read a variety of books to your child. Choose different stories with different characters to introduce your child to as many new things as possible and don’t forget to experiment with different voices. Whilst reading books is extremely important, it’s also recommended that you create new stories, without relying on a book. Craft a story featuring your child going on a grand adventure, learning new lessons and if they can, ask your child what should happen next to get them involved in the creative process. Dress up/role play – Dressing up doesn’t have to involve expensive costumes. Just give your child a range of accessories and clothes (they could even be old things you no longer wear) and allow them to choose what they want to be. For example, if they want to be a chef, make a paper hat together, give them a few pots and pans out of the kitchen and let them experiment. Puppets and props – Everyday objects can take on new life in imaginary play. Your child’s collection of stuffed animals could become the basis of an animal farm or animal hospital, they could travel back in time with their collection of dinosaurs. Books can be used to make a race track for their toy cars, even a cardboard box can make a fantastic spaceship. 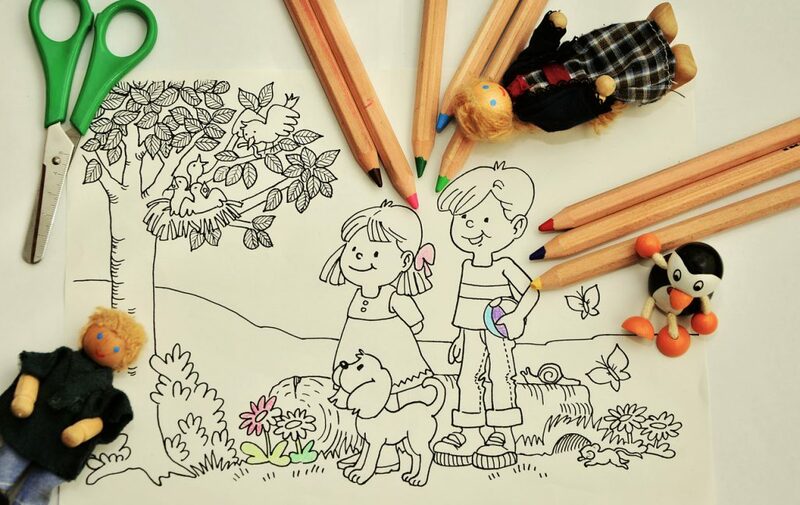 Drawing – Do away with colouring books and allow your child to create their own drawings without sticking to someone else’s lines and rules. You never know what they might create with some plain paper and coloured pencils. Journaling – This is best suited to an older child who can already write, but even younger children will enjoy scribbling away in their very own notebook. Journaling can take any form your child can imagine, whether it’s short stories, poems, comic strips, doodles or simply documenting their thoughts and feelings. All can help with their imagination and creative skills. What has your child created lately? Share your photos in the comments! Thanks for sharing your valuable information about how to encourage child’s imagination. Its very helping for the parents and even for the governesses the parents hire for their little ones. We also do same job, if you need any help please visit our website.